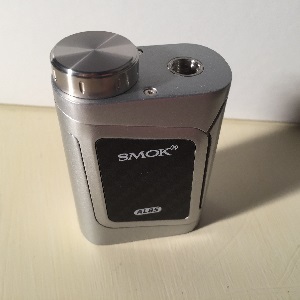 Our newest review product supplier, SmokStore, provided the newest mod from SMOK, the AL85. 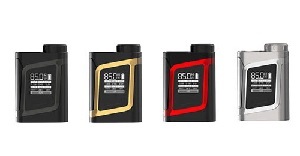 The SMOK AL85is the mini version of their extremely popular Alien mod. Both mods have the same basic shape and identical display. Other than size the biggest difference is their maximum power output. The Alien has an output of 220 watts while the AL85 maxes out at 85 watts. The AL85 is powered by a single, external 18650 battery (not included). The battery is loaded from the top of the mod via a screw on cap. Turn the unit on with 5 quick clicks of the fire button (actually a panel on the side of the mod). When you attach a tank to the AL85 with a coil that wasn’t the most recently used you’ll prompted “New coil/Old coil.” Press the up or down button to make the appropriate selection which will set the base resistance of the coil. Enter the extensive menu system by clicking the fire button 3 times. Your first option will be to select the mode the AL85 will operate in, wattage or temperature control. If you choose wattage you’ll be prompted to set the “draw effect” to soft, normal, or hard. If you choose temperature control mode your next option will be to select the max wattage, then the coil material and finally you can adjust the TCR (temperature coefficient of resistance). The final option in the mode sub menu is to set up to 8 memory presets. In wattage mode the AL85 will fire coils with a resistance range of 0.1 – 3.0 ohm. In temperature control mode it will handle coils with a range of 0.06 – 3.0 ohm. The next sub menu is Puffs. In this mode you can set a maximum number of puffs the AL85 will permit you to take within a 24-hour period. Set it to “never” to disable this option. You can also reset the puff counter to 0. Next up is the Setting sub menu. Here you can adjust the time the screen stays illuminated, turn stealth mode on or off and adjust the contrast, and lock the screen. You can also adjust the initial ohm setting, and download updates to the firmware when (and if) they become available. The final menu option is turn the power off. There are several shortcuts to the menu system. To switch power modes hold in the fire button and the down button simultaneously. To cycle through the draw effect options by holding in the fire and up buttons at the same time. You can the mod by pressing the fire button 5 times or hold in both the up and down buttons. Adjust wattage or temperature by pressing the up or down button. The SMOK AL85 has a wattage range of 1 – 85 watts in 0.1 watt increments. Temperature range in Fahrenheit is 200° – 600° in 10° increments. In Celsius the range is 100° – 315° in 5° degree increments. I attached a SMOK TFV8 tank with a V8-T10 Kanthal coil installed. I set the AL85 to 75 watts with the draw effect set to normal and gave it a first vape. It produced a very enjoyable amount of flavor and vapor. I upped the wattage to 80 and the vapor was just a little warmer. Then I adjusted the draw effect, trying “hard” and “soft”. The biggest difference was that the vapor seemed just a bit warmer on the “hard” setting. 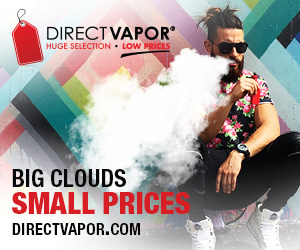 I had two concerns with the SMOK AL85, the first was, with a max output of 85 watts, how would it handle that beefy TFV8 tank with the deca-coil. Seems like that will not be a problem. The second concern was that bar like fire button. I wasn’t sure how I’d like that instead of a thumb operated fire button. Turns out that squeeze bar is pretty comfortable. 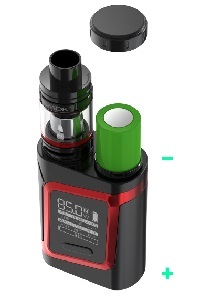 The official SMOKTECH website lists the AL85 as a pre-order item for $53.99. 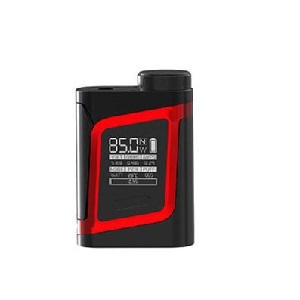 SmokStore, who supplied the AL85 for Seven Report to review, has it listed at $33.90. 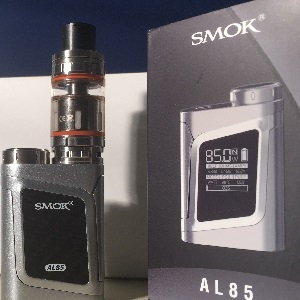 I’ll be using the SMOK AL85 extensively for the next week or so and will then post a full, in-depth review. If you follow Seven Report on Twitter or Facebook you’ll find out that way when that review is live. Find out more about or order the SMOK AL85 mod from SmokStore.